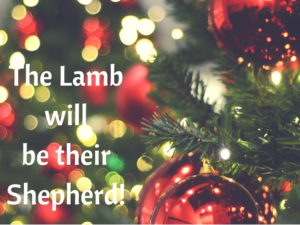 the Lamb will be their Shepherd! I’ve been thinking about the shepherds in the Christmas story today. Why did the angels share the announcement of the birth of Christ with the shepherds? Have you noticed how often shepherds are mentioned in Scripture? (Abel, Abraham, Isaac, Moses, David, Amos … Jesus!) Could it be that God chose to announce the birth to the most ordinary people of the time? Could it be that the Great Shepherd wanted his comrades to know about his birth first? Or … could it be that the announcement was given to shepherds because Jesus was the Lamb of God? Who better to know about this perfect Lamb? Jesus is both our Good Shepherd who lays down his life for his sheep and He is the perfect Lamb that was slain for our redemption. How can He be both? the sheep is the Good Shepherd of those sheep. We need the lamb – a lamb without blemish or defect – to be our sacrifice, to satisfy a just and holy God! We need the Shepherd because we are prone to wander, can’t find our way – our Shepherd protects us, guides us, leads us home! Shepherds, sheep – there is so much more we could explore! But for now, join the shepherds glorifying and praising God for who He is and what He has done! 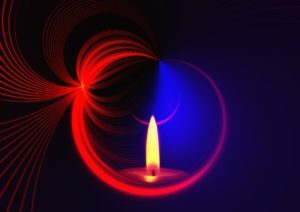 This entry was posted in Advent, Reflection and tagged Henry Cooke, James Montgomery, Revelation 7:17, sheep, shepherds, the Good Shepherd, the Lamb of God on December 17, 2016 by instillnessthedancing.